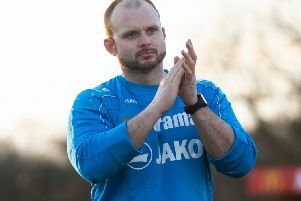 Hemel Hempstead Town manager Dean Brennan is already looking towards next season as he aims to build on a promising debut campaign in the Conference South. The Tudors narrowly missed out on a promotion spot in their first year in the division, but Brennan insists that there is much more to come in the 2015/16 campaign. “A lot of people have given us praise, but I feel that we have come up a bit short personally,” he said. “We’ve had 11 opportunities to get into the top five and not taken them, which has been mightily frustrating. While Brennan is eager to start planning for the new campaign, he admits that a number of the current Hemel squad will be on their way out of the club. “The players know that they have had an unbelievable opportunity this year and a lot of them have earned it by helping us to get promoted last season,” he said. “We’ve given everyone a fair crack of the whip but I’m very ambitious and the club is very ambitious. “This is a big town and it needs a big football club. You only get big crowds by winning titles and being involved in promotion pushes so that’s what we are aiming for next season. “We will add experience to this squad for next season – every season is a new team and a new squad, it happens at the very top level. “You look at Manchester City and players there are being questioned; top players who did the business for them. This is a ruthless business and if you want success you’ve got to make tough decisions on what is best for the team. “But that’s how football works, you’ve got to keep looking forward and you can’t get left behind. This is a ruthless business and if you want success you’ve got to make tough decisions on what is best for the team. Brennan has always been quick to act in the transfer market, and this summer looks set to be no different. “We know that other clubs will be wanting some of our players, because we want other club’s players,” he said. “That’s just how it works. “Everyone has got different opinions on players and we’ve identified 40 targets because we will be looking to bring in a very strong squad for next year. “We know exactly who we want to keep here and there are a lot of our players who still have another year left on their contract so we have a lot of stability. “The players that I want to stay know who they are, and it will be down to the other players to decide what they want to do. On his own future at the club, Brennan added: “I’ve still got two years left on my contract so as long as the club keeps growing and keeps progressing, we’ve got a fantastic opportunity to do something special here. “I’ve said all along that we need to stay positive and stick together; it’s been a frustrating season in different aspects but we are all learning. “Myself, Stuart Maynard, Steve Boone, Dmitri Kharine, Peter Holmes and Gary Levy – who’s done a fantastic job for us – we all go out there and put the effort in.